Interview of Brett Morgan – Head Coach Wasa Royals 2019. Brett Morgan is a 35 year old Head Coach from Jacksonville, Florida. Coach Morgan attended college at the University of North Florida. Brett Morgan will coach the Wasa Royals of Finland in 2019. American Football is now an international sport, being played in more than 90 countries all over the world! This great sport is taking people all over the globe and introducing them to various cultures in the process. “The Import” series allows players to share their unique travels and experiences about American Football being played internationally, but players are not the only imports involved with football internationally. Coach Brett Morgan has been kind enough to share his import experience with me. Brett Morgan has 14 years of coaching and scouting experience in six different countries, including High School, NCAA, and CFL Levels. He began his coaching career at Bishop Kenny High School in Jacksonville, Florida. 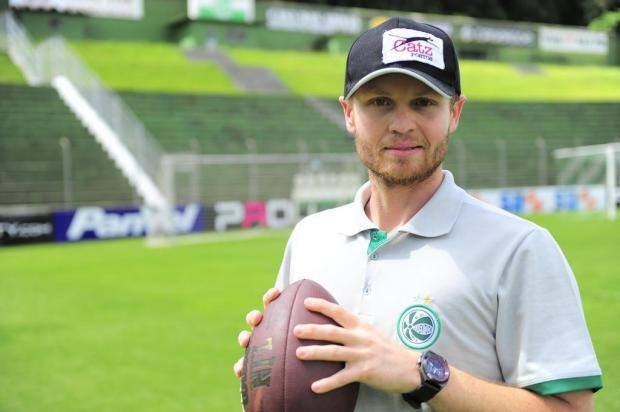 Since then, Morgan has worked for multiple teams at different levels including Eastern Kentucky University (NCAA), Calgary Stampeders (CFL), Koc Rams (Turkey), Juventude F.A. (Brazil), Firenze Guelfi (Italy), and currently the Wasa Royals (Finland). Brett Morgan is a versatile coach, allowing him to coach multiple positions and groups. Thus, he has held positions as a Head Coach, Offensive Coordinator, Special Teams Coordinator, Quarterbacks Coach, Wide Receivers Coach, Runningbacks Coach, Defensive Backs Coach, Offensive Assistant, Offensive Quality Control, Guest Coach, and Consultant. Morgan also has experience scouting as a General Manager, Regional Scout, Scouting Assistant, and Consultant. Brett Morgan has been coaching in Europe for 4 seasons, having the most success during his time with the Koc Rams. Morgan helped the Koc Rams capture their 1st National Championship in team history, during an undefeated regular season. The team also won its 1st international game, and made the European Champions League Final Four. In his one season as Head Coach for the Firenze Guelfi, Brett Morgan led his team to an Italian League Playoff appearance. Where have you coached previously in Europe/Overseas? In Europe, the 2016 Koc Rams championship team by far. What we did as a Turkish team nationally and internationally was unprecedented, and the people involved made it special. I really appreciate that experience more now, and am thankful for every player, coach, and person in management. It was a great experience. Outside of Europe, the 2012 season with the Calgary Stampeders was the most formative of my career. It set the foundation for what I’ve accomplished after, and opened so many opportunities. The team success we had, and understanding what it takes to win at any level, carries on now. Definitely, my time in Brazil. It was my first non-North American coaching experience, and I failed terribly. I’m so appreciative of that failure. It was a great teacher on situational leadership, and adapting to totally different dynamics. The relationships I built there have been the longest lasting, and I value them as much as any in my life. It’s just a special culture, with special people that I love dearly. I was looking to get back involved in football while I was finishing college, and a local high school offered me a position. I caught the coaching bug, and knew I wanted to do this the rest of my life. Eventually, I was connected with the Head Coach/General Manager of the Calgary Stampeders in the CFL, and it changed my whole trajectory. I was offered to come up as a Guest Coach initially, then did some scouting for them the rest of that season. The following season I was brought on as an Offensive Assistant, and we had a good year. Some guest coach opportunities in the NCAA came and I pursued those, but Calgary kept me involved with seasonal scouting of the NFL, which I’m really thankful for. Being seasonal at that point, I was invited to do a series of camps and clinics throughout Europe with other college and Pro coaches from the US. Those locations included Istanbul and Florence, and that’s how those relationships started. It timed up with US scouting, so my European coaching career began. I left Europe for an offer from Eastern Kentucky University as Offensive Quality Control, and it was a great experience. I’ve tried to balance coaching and scouting paths, but it’s difficult at that level. Europe provides it, so I’m excited to be in Finland coaching this year while spending more time in the NFL and colleges scouting throughout the year. Love it, I’ve seen the world through the platform of football and really enjoy the lifestyle here. Wonderful people, I’ve made connections and relationships that will last a lifetime. Everyone has been so kind and welcoming to me, and I’m thankful. Depends on the location! There’s so much variety between different regions of Europe, and it’s honestly all outstanding. It’s a huge discrepancy based on what area of Europe you are in. Anywhere from low Division 2 to Junior Varsity, but individually there are some really outstanding players that could play above Division 2. Players and teams are improving greatly. Balancing standards of excellence with being realistic and understanding. There are different factors in holding people accountable, and knowing how to give grace. I’m certainly still improving at that part. To get comfortable being uncomfortable. Adaptability and problem solving are heightened here, and will sharpen you as a coach. The critical thinking skill and situational leadership demands are unlike any level in the world, and I wish more young coaches would experience it. Off the field, the cultural exchange, idea sharing and connection will change and shape you, if you are interested in growth. Entirely different, too many to list. To appreciate the platform and opportunity you have. Each conversation counts, everything said and done makes an impact. Be in the moment and really connect. I hope my story can show that life isn’t always a straight line, that you can create new paths to your career goals. I’ve done things in football that I could never imagine possible, I think my 12 year old self would be proud right now. Don’t let the traditional career path of coaching limit you in your pursuits. I thank God for this football life and his son Jesus Christ. *I would like to thank Brett for allowing me to share his experiences.